In a birdsâ€™ kidney there are two types of nephrons present: a cortical or reptile type (nephronum corticale) and a (juxta)medullary or mamalian type (nephronum juxtamedullare). Most abundant are the cortical types. The convoluted tubules of these nephrons can be divided in a proximal tubule (tubulus proximalis), an intermediate tubule (tubulus intermedius) and a distal tubule (tubulus distalis). The intermediate tubules are characteristically short and don't pass down into the lobular medulla. 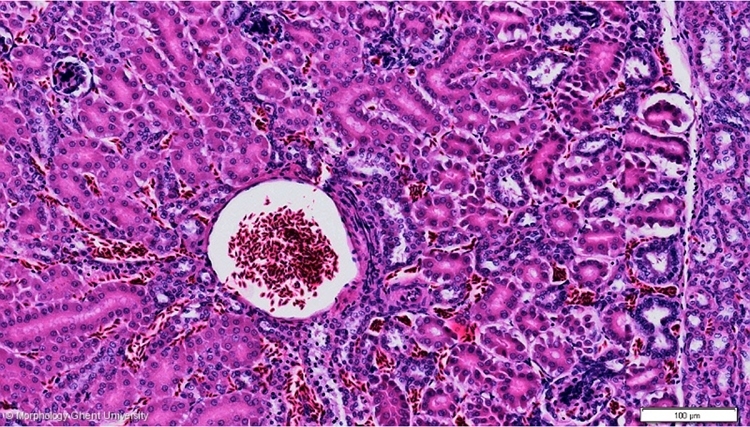 The renal corpuscules (corpuscula renales) associated with the cortical nephrons are small and lie closer to and radially organized around the intralobular vein. The juxtamedullary types have a longer intermediate tubule that doÃ©s extend into the medulla where it forms a medullary loop (ansa nephrica), which is the analogue of the loop of Henle in mammals. Juxtamedullary nephrons consist of a proximal convoluted tubule (tubulus contortus proximalis) and proximal straight tubule (tubulus rectus proximalis), a thin tubule (tubulus attenuatus), a distal straight tubule (tubulus rectus distalis) and distal convoluted tubule (tubulus contortus distalis). The desending limb of the medullary loop (ansa nephrica) comprises the tubulus rectus proximalis, the tubulus attenuatus and the first part of the tubulus rectus distalis. The ascending limb comprises the remaining of the tubulus rectus distalis. The loop thus turns in the tubulus rectus distalis. The renal corpuscules associated with the juxtamedullary nephrons are bigger and lie closer to the medulla. The juxtamedullary nephrons are able to concentrate urine. For this reason, birds living in dry areas have relatively more juxtamedullary nephrons than other birds.